The Old Head Golf Links is one of the most remarkable development ever conceived in the history of golf: An Atlantic promontory that will never be rivalled in terms of drama and beauty. It rises hundreds of feet high above dramatic cliffs, surrounded by the ocean on all sides of the, and commanding the most spectacular views from every part. Club facilities and amenities include full bar and restaurant offering a l'carte and bar menus. Clubhouse facilities include changing rooms, disabled toilet, soft spike changing. From Dublin/Shannon/Killarney, follow the signs to Cork. From Cork, follow R600 through Kinsale, over bridge. Signposted from there on. Information herein provided by the club 18 March 1999. The 220 acre promontory has allowed the composition of a 7100 yard, par 72, golf course, configured as two returning courses of nine holes, together with a practice ground facility, a chipping green and putting green. I just played Pebble for the second time and one of the people I was playing with asked me for my favorite course - Old Head without a doubt! Better than Ballybunion and it puts Pebble to shame. Don't pass it up if you are in Ireland. I played Old Head in august 2006 with 2 buddies and it was ultimate golf. 18 holes of Pebble Beach beauty and a finely designed and conditioned course. Walked it with a fine young knowledgeable caddy for a wonderful experience more than worthy of the cost. If you go to Ireland you have to play Old Head. I am a PGA pro from the midwest who just finished 4 rounds in Ireland. We played Old Head, Waterville, Ballybunion and Tralee. It was my first trip to Ireland. I have played Pebble, Spyglass, Spanish Bay, Mauna Kea, Hualalai, and 8 other courses in Hawaii. I have walked the par threes on the back nine at Cypress and spectated at Augusta 3 years. Old Head is without a doubt the greatest golf experience on the PLANET. If my math is right and the info I picked up when I was there is correct, when the Euro is 1.5 US dollars the course is making $8 million US a year. I heard great things about a couple of courses north of Belfast which I didn't see but there is no chance they will have the views and the atmosphere of Old Head. I sincerely hope you get to play it. Although I am a 17 handicap and my son is a 7, we played Old Head in August of 05. It was a bit pricy but the once in a lifetime experience was amazing. The personnel is wonderful and the caddies really know the course. For many Americans, do not request any cart. You must walk this course. It is beautiful. Once, my son commented that this is what PGA players experience. A truly magnificent course. Old Head is far and away the most unbelieveable and spectacular golf course in the entire world. I just played it in mid July, 2005 on a warm, windy day. It makes Pebble look like a muni track in west Texas. Starting with #2, you can't believe that you are actually playing golf above the amazing cliffs. #12 may be the hardest/imtimidating/breathtaking par 5 in the world. It would be an incrdible place for simple sightseeing and pictures even if there wasn't a golf course. The conditions of the greens and fairways were superb and the staff made us feel right at home. They tend to your every need without being asked. It is very expensive, but worth every single penny. They could charge double the fees and I would pay it in a heartbeat. I cannot stress enough that if you are anywhere in the area you have to play this course. It is a once in a lifetime experience. P.S. Be sure to play #18 from the black tees. It is the coolest shot I have ever hit. I recently played Old Head (9/21/05)and can attest that it is an amazing golfing experience. It has more "Pebble Beach" holes than Pebble Beach. The course was in wonderful shape and was a true test. You cannot visit Ireland without experiencing Old Head. I played this course in June 2005. As luck would have it, the weather was one of those 10 days a year when it turhed out bright, sunny, 65 degrees, 10mph winds - perfect in other words. I can't add anything to the prior descriptions that this is the most senic course you will ever play. This is golf nirvana, except that when the wind and rain is out, which is most of the time I am told, it has to be golfing hell! I didn't see it, but the idea that salt spray could climb those three hundred foot cliffs is, well, freightening. Lots of luck on those days, boys. The course is now well settled in and was in wonderful shape, greens and fairways, when I was there, the caddy was knowledgeable, and this was a perfect walk greatly enjoyed. Oh yeah, the greens fee was 250 euros, taxi to and from Cork was 100 euros total, and the caddy 50. Easily worth it, my friends. The experience fills a prominent spot in my memory. wow! that sounds fantastic, you just made me want to go and golf here!! If Pebble Beach was on the southern coast of Ireland, no one would play it! Old Head has the most awesome piece of property for a golf course that I have ever seen including Kapalua. I played Old Head back in April 2003, and like all the other reviews, the 8 oceanside holes are breathtaking, especially when confronted with 20-25 mph winds. I was the first person on the course at 7:50am, and with my caddie, McDermott, I had plenty of time to photograph the course. Some of the seaside fairways are still a bit spotty, but the greens were immaculate and putted pure. Regarding the #12 tee shot, imagine hitting your tee shot for the first time on #18 at Pebble Beach, then add a cliff drop of about 200 ft. plus! Same thing goes for the drop alongside the green. Price was hefty at $250 euro, but as they say, well worth the experience. 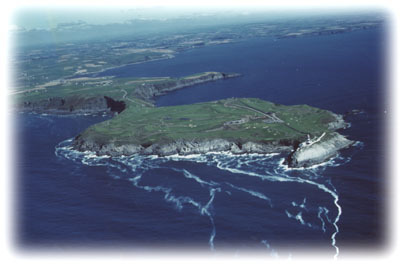 Visit Old head at www.oldheadgolflinks.com and see the virtual tour of #12. If the Art Director from LORD OF THE RINGS were to design a golf course, this is what their imagination would come up with. Dramatic cliffs, sweeping views, ocean surrounding the entire course and then top it off with an amazing history, and you have one remarkable feast for every one of your senses. We played in September 2003 and the course was practically ours. We had more than enough time to play a well-tested game without anyone in front or behind us. This allowed us to enjoy the game and absorb the beauty that surrounded you. While each hole is gorgeous in its own right, you MUST take your time to enjoy hole #4, 7, 12, 16 and 17. Bring a camera and your best buddy to capture a memory you will never, ever forget. You must, absolutely, without a doubt and without hesitation, play this course! If you're not convinced yet, then you need to slap yourself in the face and wake up. You will never forget the experience...ever...and isn't that one of the charms of a great golf course? I spent 17 days traveling Scotland & Ireland and Old Head by far was the most beautiful course we played. The view will take your breath away. The golf course is very will manicured and challenging. If you play anywhere in Ireland, you most play this course or you have missed a once in a lifetime experiences. Also the people in Cork where the course is located are very friendly. is this the same mike ryan who is a member at moor park golf club and who I played the 18th hole with on feb.5th? Old Head is, without a doubt, the most spectacular course I have ever played. The views are staggering. It's quite expensive, but not as much as Pebble Beach or Pinehurst #2. And one cannot overstate the beauty of the place. Plus, it has about the nicest clubhouse/bar/restaraunt of any golf course I've ever been. The service was superb. Great concierge, great food, friendly staff. I'm about a 5-7 handicap, and I played it in a gale, shot 92. I mean I striped it to shoot that! It was borderline unplayable--weather-wise-- but the course held up beautifully. It got comical after a while, watching really solid shots fly 50-75 yards offline, but 35-40 mph sustained winds (gusts up to 60) will do that. Old Head is a must for any serious golfer. Up there with Pebble Beach, Kapalua (Plantation), and my other favorite course, Ballybunion (Old). Simply put, one of the finest golfing experiences of my life, including Pebble and Pine Valley. I will never return to Ireland without visiting my friend, Old Head Golf Links. Spectacular views on all 18 holes, a majestic layout, challenging for the best in the world as well as the rest of us, not much left to say. A group of friends and I have had the opportunity to play Old Head four times in the last three years and am looking forward to our annual trip in July. There was an article I read calling Old Head the most spectacular golf course in the world and we truly believe this. I have played Pebble Beach many times and believe that 7, 8, 9, 10 and 18 are five of the greatest holes you can ever find on a golf course. However, there are eight holes at Old Head that blow those holes always in terms of drama, beauty and excitement. There are many truly outstanding golf courses in Ireland, but Old Head is always on the top of our list. This is not just the most beautiful golf course in the world; it's the most beautiful place in the world. It's very expensive, very challenging, very windy, and very haunted. (Ask about the Lusitania and Titanic). The wind sweeps off the sea, up over the cliffs and deposits sea life on the fairways and greens. It's nice not being the only fish on the course! I played my worst round of golf in four years and loved it. Old Head's worth the trip from the USA or Europe even if you have to walk. I played Old Head in 1998 with Ray Cawley. I have played golf all over the world, from the foot of the pyramids to Mauna Kea. This was by far and away, THE most visually striking course I have ever played. Ballybunion, Royal County down, Portrush are all great courses, but they play up to the ocean or cliff edge and then come back. This layout has you playing on a cliff-edge on virtually every hole. I was very, very tempted to obtain an international membership, just because this struck me as Europe's equivalent to pebble beach. And we don't live in Ireland. If you get to Ireland and enjoy stimulating golf, you must play old head. As some of the other reviewers indicate, it probably does need a few years to settle down, to let the grass that will live under the salt spray conditions get established. But this, in my opinion, is already one of the world's best golf courses. involves carrying a chasm that begins a coastal trip ending up 600 feet above sea level. They were building a new green there set hard by the cliffs. The only problem is that it will take you a minimum of 5 hours to complete the course. Long walks to tee boxes, high-handicap, wealthy, corporate play, and frequent photo ops result in a long day. However, there may be no better place on earth for a slow walk!! Our caddie was neatly dressed and we could actually understand him, unlike some of the 'seasoned' caddies elsewhere. Don't pass this up with excuses like: it's too far, or it's too expensive. Go to Old Head and see the 8th wonder of the golfing world. My trip to Old Head was in June of 1999, this course is by far the most scenic course I have ever seen. The views never stop from the first hole to the eightieth. The course was in spectacular condition, except for some working being done on a few greens because of the salt spray form the ocean. If you can get over the views the course is not overly difficult, that coming from a 11 handicap. I would recommend this course be first on your list when travelling to Ireland to play golf. My first trip to Ireland was this last summer in July (98). By far, this golf course was the most scenic. It was a clear beautiful day and the golf course was in very nice shape. My cousin Jim who has played golf all over the world said this course made Pebble beach look like a municipal course. 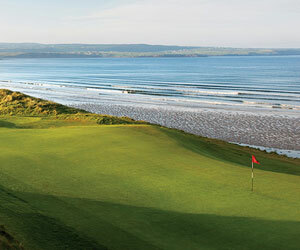 ( in terms of natural beauty) I am looking forward to going back to Ireland some day to play this majestic golf course. Played Old Head at the beginning of June as part of a tour package with a society. Hospitality and food was excellent and the staff were very friendly (aren't they always in Ireland ??). The course itself is a test for the average golfer and as a 22 handicapper it can lead to you spending a long time looking for your ball!! Spectacular views across the Atlantic make it worth the visit for that reason alone. In terms of condition the course most probably needs a bit more time to settle down, some of the fairway bunkers are a bit rough (some of them give you a free drop !) and it was very disappointing to suffer a temporary green on the 17th. The temp green was just a hole cut in the fairway 50 yards from the original, if you are going to spend anything between £60 - 90 then you expect a little more for your cash. We didn't come across an Irish accent on the course while we there, just visiting Americans and Brits, it left you with the feeling that you could have been playing golf anywhere and didn't have that 'crack' that you get when playing true Irish courses. In a nutshell, if you can afford the experience and the splendour go for it, if you want to have a fun day out and relax try the 'home' Irish courses and enjoy the 'crack'.